Passionate women & men sharing resources & taking action for women and girls in Western New York. 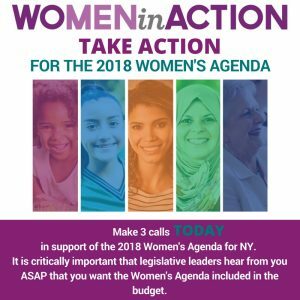 Keep scrolling for current ways to take action and check back regularly for new opportunities to support the WNY Women’s Foundation’s advocacy efforts for women and girls. Follow us on on Facebook, Twitter, Instagram, and LinkedIn for timely calls to action and updates. 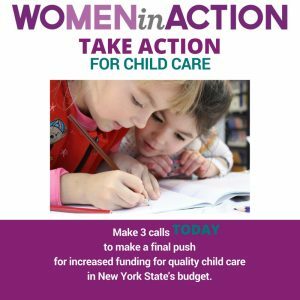 We are urging you to make three phone calls today with this quick and simple message to make one final push for increased funding for child care subsidies in New York State’s budget. Please help us get the word out! 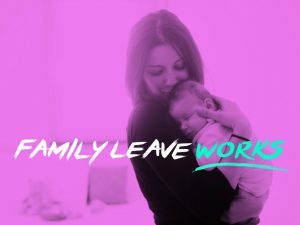 Make sure you learn the facts about Paid Family Leave and share them with your friends, family and coworkers. A free, confidential, legal hotline is available to have your questions answered – 1-833-NEED-ABB.